If you were assigned to come up with a vehicle to take on the Pikes Peak International Hill Climb what would you look at first, performance or weight? The June 24 “Race to the Clouds” starts at about 9,115 feet above sea level and climbs about 4,700 feet before it ends at 14,115 feet. During the race, vehicles climb about 12.4 miles from start to finish. Given the relatively short length of the race, as well as the rather abrupt rise in the track, it takes a bit more than power and handling to take on this course. Which is why Volkswagen Motorsport is putting some rather massive resources behind its I.D. R Pikes Peak, the electric racer the automaker plans to use to conquer the Peak. The I.D. 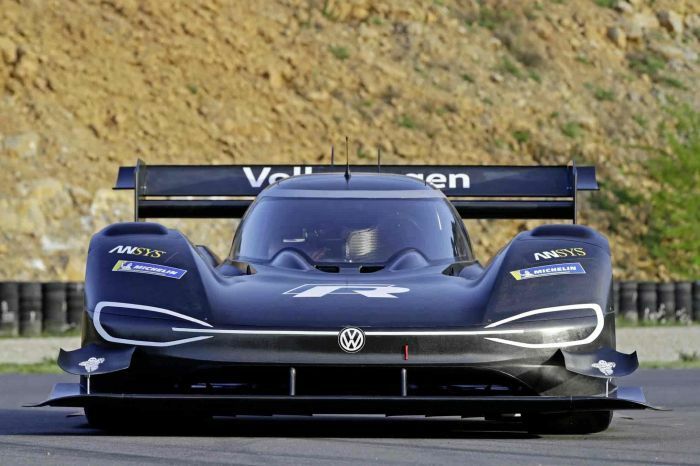 R Pikes Peak is Volkswagen’s first fully electric race car. It will take on the world’s most famous hill climb on June 24th in Colorado Springs, Colo. The automaker seeks to break the electric prototype class record, which currently stands at 8:57.118 minutes. Testing focused on obtaining the critical compromise between performance and weight. These factors are more dependent on each other in an electric than in a race car with a conventional internal combustion engine (ICE). There is a simple rule of thumb for developers: the greater the performance, the heavier the batteries required. However, since they were fighting a mountain and race track in the clouds, they knew that every added gram of weight was unwanted. During the race, cars have to overcome the huge difference in altitude that amounted to more than 4,700 feet on the way to the finish line. The I.D. R Pikes Peak – the performance member of Volkswagen’s (the brand) growing I.D. family of electrics – faces a series of hairpins as it spools up the mountain. These turns put a heavy vehicle at a decided disadvantage in braking and accelerating out of corners. Given the information they gathered, engineers on the Volkswagen Motorsport team decided on a simple strategy: make the I.D. R as light as possible, while maintaining performance. In some racing venues, entries face a rigidly prescribed set of rules as to weight, aerodynamics and the rest. However, there are virtually no rules for the “Unlimited” class in the Hill Climb. This gives the development team complete design freedom. So, engineers, having been handed a blank sheet of paper and then having been told to design a brand-new racing vehicle from scratch, set out to create a unique car. “To develop a car solely for this 12.4-mile hill climb is a very special task. There were virtually no bounds to the innovation shown by engineers,” Francois-Xavier Demaison, tech director at VW Motorsport, said. Rampf said in an interview that simulations “played a major role in achieving the low weight of the car.” For example, computers were used to design chassis parts in such a way that they can cope with anticipated loads with no problem and without appearing oversized or overweight. The developers nearly completely dispensed with standard materials used on the highest levels of motor racing, such as titanium. “The chassis, suspension and safety features of the I.D. R Pikes Peak are almost completely made of steel and aluminum,” Demaison said. Despite this, the car and driver weigh less than 2,425 pounds – a real lightweight as compared to Pikes Peak category electric race cars. Using a relatively low output 500 kW – 671-horsepower – set of motors allowed developers to place the vehicle’s battery components next to and behind the driver for best weight distribution. The batteries provide power for front and rear electric motors. Electronics handle torque distribution. Keeping the body as light as possible, the chassis and aerodynamic development team built the chassis and aerodynamic components of a lightweight carbon-fiber/Kevlar composite. One of the tasks faced by the design team was integrating design elements from the I.D. family in the exterior of the race car. “During this phase of development, we worked particularly closely with our Volkswagen colleagues in Wolfsburg,” Rampf said. VW’s engineering team reduced weight wherever it could. For example, driver Roman Dumas’ fire-retardant racing suit was lightened as much as possible by VW’s technology partner OMP. They also kept the weight down on the seat padding and six-point driver’s sea harness, as well. Even the sponsor logos are silk-screened on to the racing suit to save weight over current patches. The only thing VW Motorsport couldn’t overcome was the rule that each driver must wear a large event emblem on their racing suits. Though they had planned to use silk-screening as well, they had to settle for the sewn-on 15.7-square-inch emblem. “The threat used for that weighs almost as much as the entire suit,” Demaison quipped.